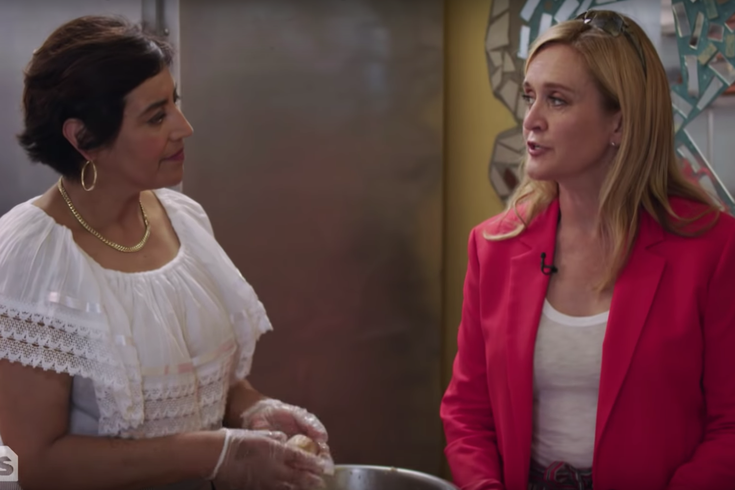 On an episode of Full Frontal with Samantha Bee on Wednesday, Aug. 15, Cristina Martinez of South Philly Barbacoa talks immigration politics, food, and being a chef. Late-night host and comedian Samantha Bee brought Full Frontal to Philadelphia this season. This Wednesday's episode featured South Philly Barbacoa chef and immigrants rights activist, Cristina Martinez, who has openly discussed her undocumented status — but never the family recipe for her mouth-watering barbacoa. Martinez explains to Bee in her South Philly kitchen that she fled her home of Capulhuac, Mexico because she was being assaulted by her ex-husband. "I just wanted to save my life," she says. The pair discuss the ways in which Martinez wants to use her platform as a successful chef to lobby for other people with undocumented statuses in the U.S.
"I'm not afraid to talk about the platform that chefs have because we have the power to change the system," Martinez says. "We, as chefs, have a direct platform that is so big, we chefs would not be able to be chefs without our farmers, the people who clean, like the dishwashers, the waiters, the bartenders." Bee is selling T-shirts to raise money for immigrants that work in the restaurant service industry. A portion of the proceeds will go to The Giving Kitchen, an organization that provides emergency assistance to restaurant workers through financial support and resources. You can donate here.